Classified as a National park, Samaria Gorge is one of the most spectacular natural parks in Europe. 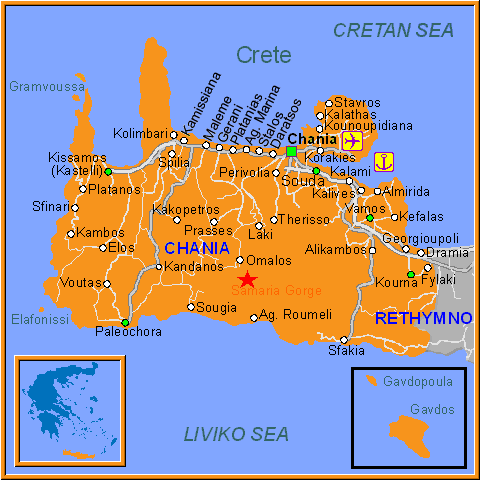 Starting south of the settlement of Omalos, 42 Km south of Hania, spans for 18 Km as far as the south Crete coast. The only way to see the gorge is to walk through its entire length, sometime between May and October when passage is permitted, but rest assured that the five or so hours that you spend in this gorge will award you with incredible views.Take the pedestrian path walk at Ksyloskalo, the gorge's entrance, and start your descend in the gorge. After about three hours of walk at a normal pace, you will have descended by 700 meters of altitude on a zigzag path that brings you to the deserted village of Samaria with its 14th century chapel. You will notice that although the sun is high in the sky, the gorge is always in the shadow. Used as a hide out during war years, is now haunted by the Cretan "ibex" known as "Kri-Kri", the chin bearded wild goat of Crete with thick, curved, ridged horns, and only if you are lucky you might catch a glimpse of one. Equally rare is "Dictamon" a herb very much appreciated locally, found on the cliffs of the gorge. One mile before Agia Roumeli at the southern exit of the gorge, is the famous "Sideroportes" (Iron Gates), where the rock wall rises 300 meters on either side of the passage, only 3 meters wide. Remember that the walk through is a one way venture as you start from an altitude of about 800m above sea level going down to zero. For this reason you will probably use public transport from Hania to arrive early morning in Omalos, and at midday you can catch a boat from Agia Roumeli to Chora Sfakion. From there, again by bus, you will arrive exhausted back to Hania to meet your transport. Alternatively you can buy this excursion as a package sold locally in many resorts. You will be picked up from your hotel, very early in the morning and will be brought back in the evening. A slightly more expensive method but worth trying it. Online Travel guide with the best accommodation in Samaria Gorge. Find the cheapest hotels is Samaria Gorge & get exclusive online deals. Great rooms at bargain prices. Book online now! Compare Hotel Prices and read Reviews from others. Great Hotel rates and information See photos, reviews & what's nearby Samaria Gorge . Detailed tourist and travel information about hotels of Samaria Gorge providing also regional information.